To cook the wild rice, fill a medium-sized saucepan with water and bring to a boil. Add the rice and a few pinches of salt. Partially cover, and simmer on medium heat for 45-50 minutes. (For brown rice, simmer for 30 minutes) Taste to see if the rice is done, and if so, drain and shake a few times to release all the steam. Drizzle with a tiny bit of olive oil to keep grains from sticking. Preheat oven to 350 degrees. Place sweet potatoes on a baking sheet, drizzle with oil, salt and spices to taste. Bake for about 35 minutes, or until squash can be easily pierced with a fork. (25-35 minutes for sweet potatoes until fork tender) Cook the corn for 2 minutes in a skillet or boiling water. Prep the other vegetables: Slice the red cabbage, paper thin. Set aside. Open the pomegranate. Slice avocado. To make the sauce: Place the cilantro, garlic, lime juice and 2 pinches of salt in a blender. Add 1/2 cup oil, and pulse to blend. The bowl: Reheat the rice or wild rice. 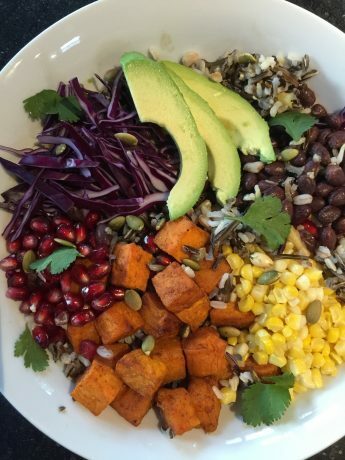 Top with corn, black beans, pomegranate, avocado and warmed roasted sweet potatoes. Spoon some sauce over the bowl, and also pass remaining sauce. Substitutions and/or additions: red onions, feta cheese, diced tomatoes, roasted shredded chicken or pork.